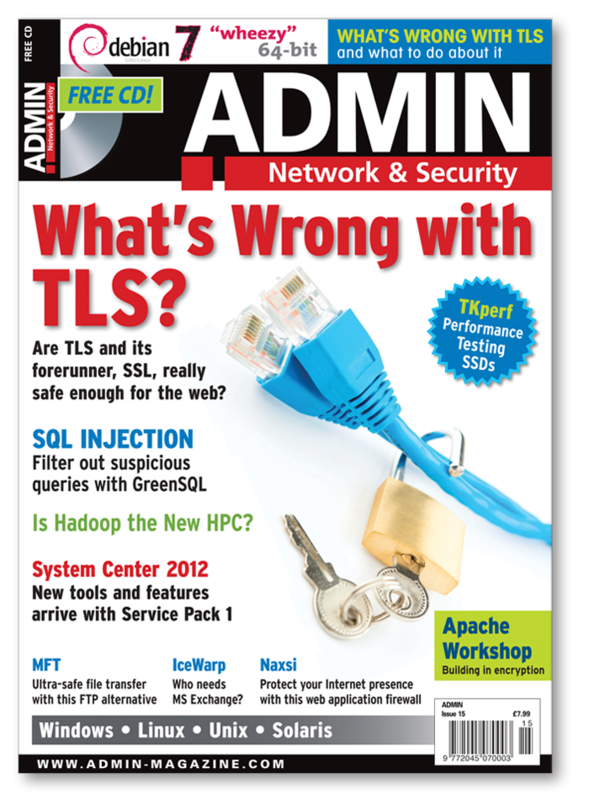 Issue #15 (Print): What's Wrong with TLS? In this issue, we look at web security – TLS vulnerabilities, a web application firewall, and an SQL injection remedy. Are TLS and its forerunner, SSL, really safe enough for the web? TLS Security: The TLS protocol is showing its age, but newer standards help. Nginx Naxsi Web App Firewall: The powerful Naxsi module converts Nginx into a web application firewall, protecting web servers from script kiddies, scanners, and automated tools. GreenSQL: GreenSQL acts as a reverse proxy between an application and the DBMS, intercepting SQL injection attacks. HPC with Hadoop: Hadoop with the MapReduce framework works well with Big Data. IceWarp Mail Server: The IceWarp mail server is a worthy stand-in for Microsoft Exchange. Red Hat Cloud: We look at the many changes to the Red Hat cloud lineup. Managed File Transfer: MFT could be the answer to your secure file transfer, auditing, reporting, and storage problems. Configuration with Puppet: Automated configuration of servers. OpenVMS on VAX: Revivifying VAX via emulation. Open Source Cloud Solutions: We look at four open source cloud solutions: OpenStack, Eucalyptus, OpenNebula, and CloudStack. OpenStack Cloud: Refinements continue in OpenStack Grizzly, which returns compute cells and offers mutiple-factor authentication, a choice of back ends, and numerous small enhancements. System Center 2012: Service Pack 1 brings new cloud and virtualization features. TKperf: Collect SSD and HDD performance data. Apache SSL: We reveal three directives and a few commands that will help you secure your website. Password Management: Plan your transition from ad hoc to centralized password management. Performance Tuning Dojo: Find out everything your computer knows about its drives – both solid state and spinning. Data Migration: We look at 10 tools to help you migrate data. Admin Story – FreeIPA: Migrating from an LDAP to a FreeIPA authentication system might be easier than you think. News: Oracle addresses Java security; Apache attack discovered; Microsoft service hunts botnets; X.org vulnerabilities discovered; Drupal.org hacked. New Products: Monkey web server for embedded devices; AlienVault virtual appliance, and new Heroku Cloud API.